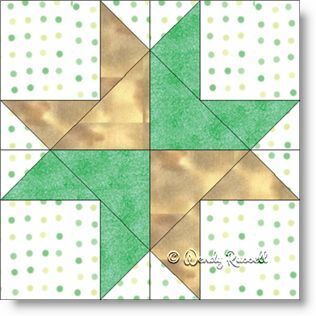 This Friendship Star quilt block is different than the one that I am most familiar with. I liked how this block went together -- a little different than the usual construction of the individual "chunks" of a block. I liked the change up. This quilt block is a four patch which really means that the individual small cut pieces are sewn into four separate, larger patches. Those larger patches are then sewn as quadrants of the final block. This block would look great as a scrappy block -- as long as you made sure that there were obvious dark and light fabrics used in order to achieve the necessary contrast. The sample quilts illustrated show a simple side by side layout of the blocks as well as a quilt with blocks set on point for a different look. It is now all up to you.